Every year, TIA has a Cinco de Mayo festival! 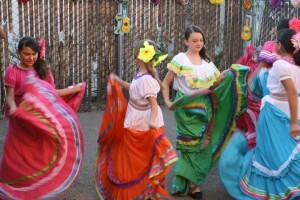 Students perform Mexican dances, e.g. La Raspa, with poetry recitations. Students that have won prizes at the Southern Arizona Language Fair also receive their trophies on this night. In keeping with Cinco de Mayo tradition, good Mexican food is a crucial component in all of our festivities. Not only do the holiday celebrations make for lots of fun, they are a great opportunity to reinforce cultural appreciation for our students. Cinco de Mayo, or the 5th of May, commemorates the Mexican army’s 1862 victory over French forces in the Battle of Puebla during the Franco-Mexican War. Many people think Cinco de Mayo is a celebration of Mexico’s independence, which was actually declared some 50 years before the Battle of Puebla. Mexico’s Independence Day is celebrated on September 16th. While the Cinco de Mayo holiday is not celebrated widely in Mexico, it has become very popular in America in area’s with big Mexican-American populations. Many cities have parades, festivals, mariachi band performances, parties, and of course, lots of traditional Mexican food and drinks.